Yes! It's the pulseless heart! 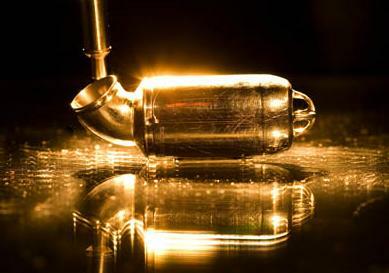 Texas-based engineers have announced they are working towards a radical new "pulseless" artificial heart, able to act as a complete replacement for a normal human one. Matt Franchek and Ralph Metcalfe, mechanical engineers at Houston Uni, will team up with medico-boffins at the Texas Heart Institute. The idea is to completely replace a heart with two electrically-powered rotary turbopump units, as opposed to reciprocating units which "pulse" just as the heart's ventricles do naturally. One pump will drive the pulmonary blood loop, carrying oxygen from lungs to heart; the other would drive the systemic loop, distributing the oxygen through the body. "We are very much looking forward... to the potential development of an effective, reliable mechanical replacement for the failing human heart," says Metcalfe, who is also a prof of biomedical engineering and mathematics. Will that bacteria just make you a bit ill? Or do hospitals need to roll out their spare beds? Accept for a second that robot surgeons exist. Who will check they're up to the job – and how?